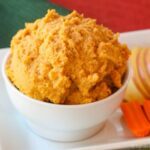 A slightly sweet and nutty version of hummus with just a hint of maple and a touch of cinnamon and to enhance the sweet potato flavor. 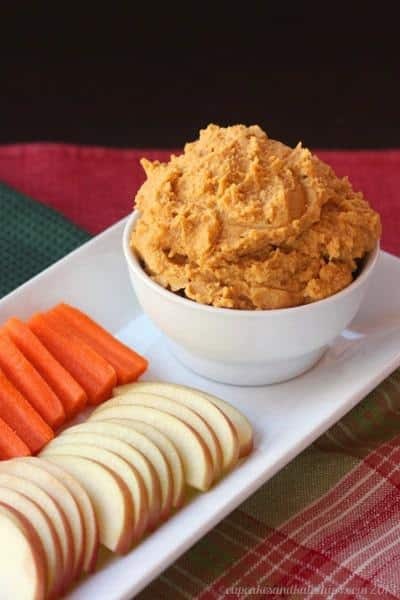 Dip carrots, apples, crackers, and more for an easy appetizer or snack. The kids love finding this in their lunchbox. 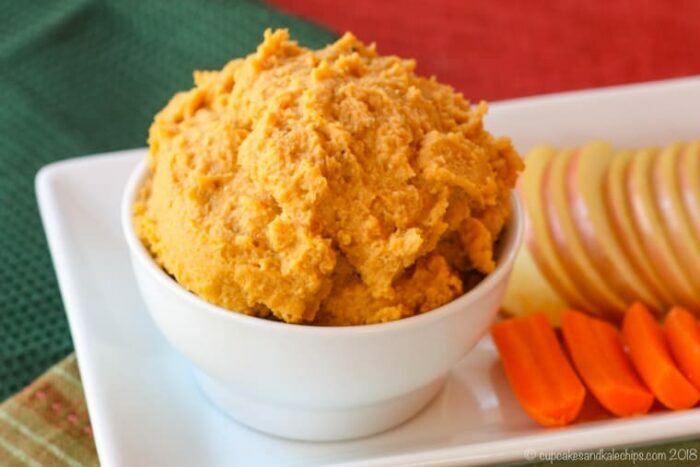 Sweet potato hummus is a sweet and savory way to change up everyone’s favorite dip. Blend up chickpeas and leftover mashed sweet potatoes, then add even more flavor with maple syrup, walnuts, cinnamon, and ginger. 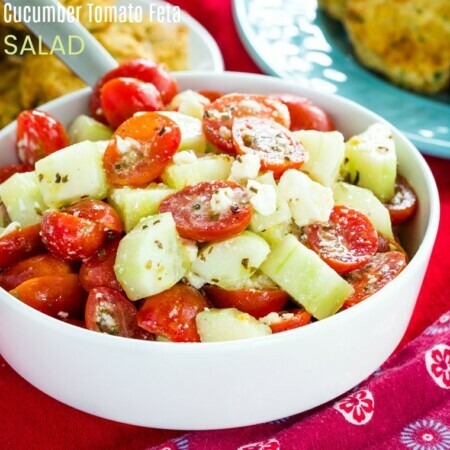 Perfect for an appetizer or snack that’s also a naturally gluten free and vegan recipe, and you can even pack it in the kids’ lunchboxes. 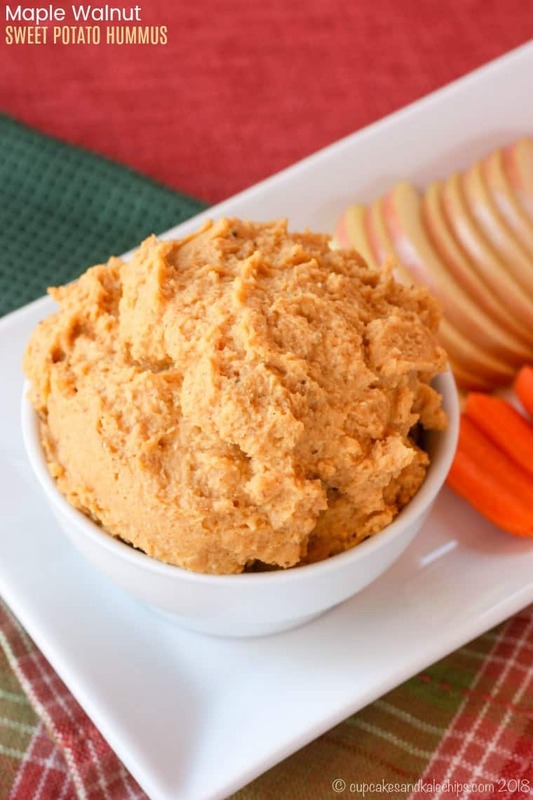 Get your apples, carrots, and crackers ready, and blend up a batch of Maple Walnut Sweet Potato Hummus. If you have leftover baked sweet potatoes, this is the perfect recipe to make to use them up. All you have to do is take those leftover sweet potatoes, a can of chickpeas, and a few other ingredients and whiz it all up in a food processor. 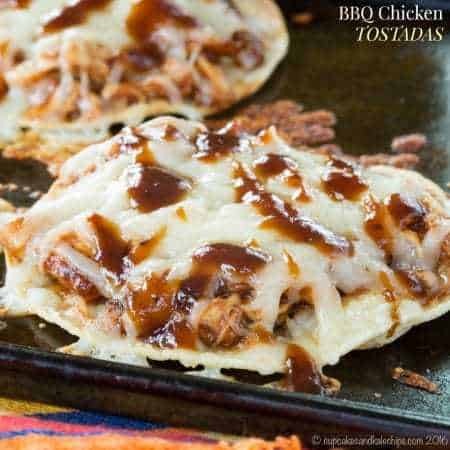 It’s delicious with apples and carrots, spread on sandwiches and rice cakes, with some of the various flavors of tortilla chips that are out there, and scooped on salads. But there is a hint of sweetness, so I don’t see why you couldn’t make it a sweeter snack, perhaps with some graham crackers since the flavor is actually reminiscent of pumpkin pie. Pumpkin pie that you can eat by the spoonful and still call it healthy? I’m in! The Bug loves sweet potatoes. He will devour an entire one with his dinner, and then ask for more. As evidenced by how often this sweet potato hummus has been showing up in his lunch, he obviously likes it too. Of course that may have to do with the fact that I had to tweak the recipe a couple of times to get the flavor that I liked, so we had a couple of batches around. At first, the flavor of the walnuts and olive oil overwhelmed the subtle sweet potato flavor and the hint of spices. Now I think this is just the right balance, so that none of the flavors overpower the others. So what did the kiddo think? One day he asked for a snack. Well even though he made it clear he wanted peanut butter (and I might have lied and told him this was peanut butter since it had the right color), I gave him apple slices and some more of this dip. He polished it off in minutes. You can roast sweet potatoes on a baking sheet for about 45 minutes to an hour or make Instant Pot Sweet Potatoes if you don’t have any leftovers. When you drain the can of chickpeas, reserve some of the liquid. Using all olive oil when making the hummus overwhelms the flavor of the sweet potatoes and walnuts, so you can use a more neutral oil like avocado oil or, as I prefer, swap some or all of the oil for the liquid from the chickpeas. This also cuts down on calories and fat. Start with two tablespoons of liquid and add more to your desired consistency. If you like you can toast the walnuts in the oven to get that more rich, nutty flavor, but it’s not necessary. For more of a dessert hummus, you can add more maple syrup. You can serve with pita chips like a traditional hummus, but I prefer apples and carrots or graham crackers. 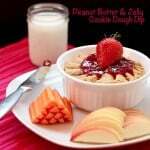 Peanut Butter and Jelly Cookie Dough Dip is another sweeter twist on hummus. Smoky Pumpkin Black Bean Hummus adds another orange veggie to change up your hummus. Pumpkin Pie Spice Melting Sweet Potatoes has all the flavors of this dip in an easy side dish. 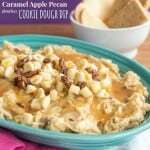 Caramel Apple Pecan Flourless Cookie Dough Dip also has fall flavors in more of a dessert-style hummus. 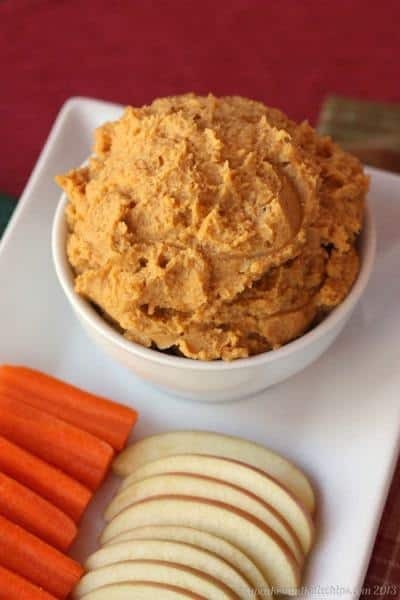 With the perfect hint of sweetness and spice, this easy recipe for a savory sweet hummus will change the way you think about your favorite dip made out of chickpeas. It’s not exactly a “dessert hummus” like this White Chocolate Macadamia Nut Cookie Dough Dip, but it’s not your usual savory, garlicky traditional hummus either. The sweet potatoes and maple syrup give it just a hint of sweetness. 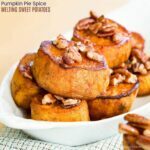 There is the hint of nuttiness from the walnuts, and just a bit of your favorite fall spices to round it all out and enhance the sweet potato flavor. It makes a great appetizer with the usual carrots and crackers, but you can also dip apple slices or graham crackers for a sweeter snack. 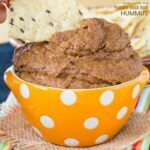 If you like this easy hummus recipe as much as we do, I hope you’ll leave a comment and give it a FIVE STAR rating and share a photo on this pin on Pinterest! Combine all of the ingredients except the reserved liquid and/or oil in your food processor or blender and puree. 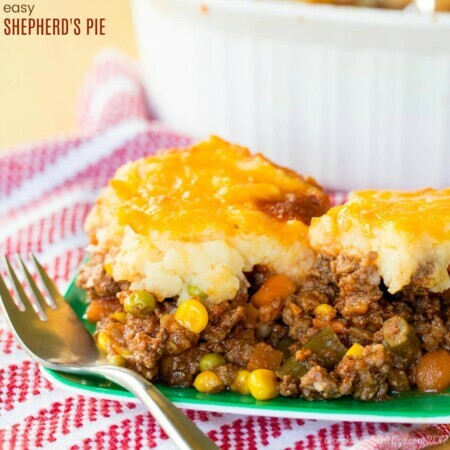 Continue to puree and add oil and/or reserved liquid slowly until you have achieved your desired consistency. May I use cashews instead of walnuts? Rhonda, you should be able to substitute the walnuts with any other type of nut. I hope you love the recipe! 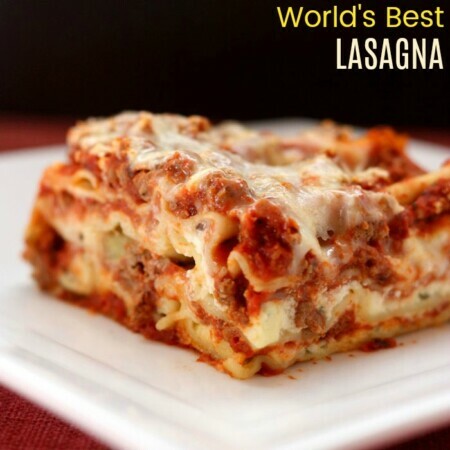 I tried the recipe this afternoon and it was delicious! I added a little honey and instead of olive oil, I used melted coconut oil and it turned out. I’m assuming it was a little sweeter than yours but my fiancé loved it. Love the coconut oil! I’ll have to do that next time.